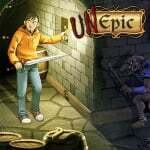 The Wii U had its share of quality download-only games, and one that certainly deserves mention is Unepic, developed by Francisco Téllez de Meneses and published on the last-gen system by EnjoyUp Games. That arrived back in early 2014 and the developer has been busy - as it turns out that'll be to the benefit of the Switch eShop. The developer confirmed over the weekend that both Unepic and his most recent game, Ghost 1.0, are in the works for Nintendo's system; the latter is also still planned for Wii U, which is nice to see. 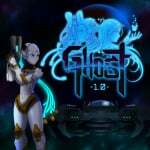 Ghost 1.0 is a stylised 'Metroidvania' that looks to have some nice visuals and clever touches, receiving a positive reception on Steam since its PC release in June 2016. Are you looking forward to either of these on Switch? Huh, first I've heard of it. Looks interesting. Ghost looks cool! Unepic hasn't ever really grabbed me. Ghost 1.0 caught my attention. Even though I'm pretty sure John Connor is a boy, Ghost looks pretty cool. Lovely graphics...let down by the web browser animation. Depending on how much it costs I'm willing to give ghost a chance. The very first thing that popped into my. @NapalmPsalm Don't get me wrong, there is a place for that style, but it so sells games like this short I feel. Ghost looks ok but I will pick it up if I am really bored. But unepic I did like I didn't finish it because the game froze or did something and I lost my save...never went back. It was fun and the humor was bearable. I'll download Ghost if the price is right. I already own Unepic on Wii U. I'm glad they're still working on Ghost 1.0 for Wii U. The announcement was made a few days ago. I am getting ghost for switch. @GrailUK I can understand that, but for me it makes my eyes want to vomit. I equate it to that thing you ate once and made you sick and then if you smell anything like it you start to get sick. So yeah, I couldn't get over this style if I wanted to. The only time I noticed it never bothering me is with MapleStory when I gave it a try. Even then I only tried that game for a hot minute because I could play it for free. @SLIGEACH_EIRE Yeah, it's portable now, you don't need remind us about it. I'd get Ghost if it gets good reviews. Neither game interests me. Meh. Nice job on the trailer for Ghost 1.0. Keen to give this a shot. I got UnEpic for Wii U on a sale and even those 5 or so € for it were too much tbh. At the time anyway, I've read they since updated the game - on other platforms - but it just threw some really dumb arbitrary crap at you out of nowhere at one point which completely killed the game for me. If they fixed that, it's probably worth its price, especially because it apparently got a multi-player option or mode or something. If they didn't, don't bother. It's not horrible but it's incredibly average outside of the premise, which got old quick imo. Ghost 1.0 looks like a million and one othet metroidvania games. I'll pass. Truth be told I think metroidvania games would be better if they didn't all try so hard to adhere to super metroid. Game maker's toolkit made an interesting video about making a soulslike genre and he mentioned how when we make a genre out of a single game, it can limit creativity by forcing other games in that genre to copy the design of one game instead of experimenting. @GrailUK " Web browser animation" is that what it is? I keep watching the trailer, but something about it looks off. Unepic is one of those games I always intended to play but never got around to, so I'll probably pick it up on the Switch. Will definitely be downloading Ghost 1.0, which looks excellent. I got stuck playing Unepic on my Wii U, and didn't finish it. There is a monster that looks like a brain that forces you to drink all of your potions and he killed me like 5 times and I got bored. Good game, shame, because I was having some fun with it. I liked Unepic a lot. I played the highest difficulty level but never could beat the final boss for the end path that I chose. I will definitely download it again on my Switch. @Al_Godoy I died a LOT fighting that brain monster on the hardest difficulty setting, but each time I experimented with different tactics, & eventually figured out that a certain spell worked VERY well against him (I think it was one that generated coins, or something like that), & I got to the point where he became very easy. Porting another old game is not a highlight. 12 months since release is old. Port-tendo Switch. And I say that with love and respect but come on the number of ports is just ridiculous. I'm still waiting for some genuine new and exclusive content beyond the 4-5 first party Nintendo games this year. Ghost looks like a flash game. It's a new console. It gets tons of ports. As has been the case with every console since 2001. Interested in Ghost 1.0. Metroidvania games are always welcome. Let me guess: Ghost is rogue? Everything is rogue nowadays, sadly.